Well… On the bright side: The UN Climate Chief has finally decided to adopt a certain modicum of honesty in her crusade to rid the world of pollution. As suspected by capitalists, free market advocates, and anyone who read into the redistributive agenda of the UN Climate Scientists, Christiana Figueres has suggested that only communism is capable of successfully fighting global warming and “climate change”. She went on to suggest that China is a better steward of environmental concerns than the United States, Socialist Europe, or any capitalistic entity on the face of the planet. And, to an extent, she’s right… China would like to breathe air they didn’t have to look at… Of course, their solution so far has revolved around handing out face masks, and erecting giant LCD screens to broadcast the sunrise and sunset. China has struggled with environmental disaster since central planning bureaucrats first crept into the field of industrial planning. 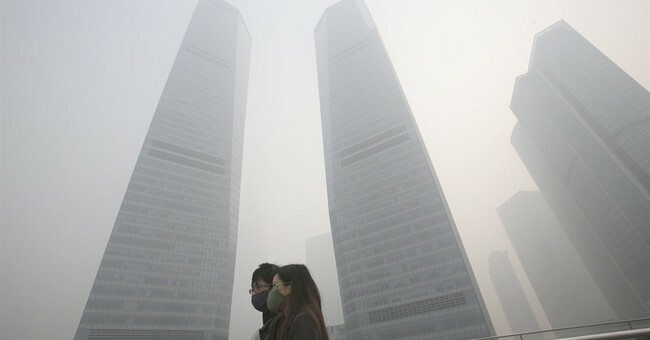 And while China has suffered through smog storms that make turn-of-the-century Philadelphia look like a clean-air-utopia, the civilized world (led primarily by free markets and capitalism) has cleaned up their act environmentally and morally. While the Soviet Union was busy draining lakes, and pumping sulfur into the German atmosphere, the West was busy inventing catalytic converters and low-emission power-plants. And while America’s carbon footprint has largely stood still, that of China’s has grown to a burdensome (and worrisome) level… So, objectively, Christiana Figueres is more than wrong… She’s an outright ideological shill with little concern for historical context, or objective evaluation of environmental stewardship. Of course, to be fair, environmentalism has never really been about caring for the environment. Capitalism has proven to be the greatest anti-poverty scheme in history, and has also thrust most of the developed world into a space-age era of technological, and socioeconomic, progress. And while capitalism has thrust the human condition into realms of universal luxury not previously imagined, the statists, socialists, communists, and elitists have bemoaned the individual power guaranteed by economic freedom. With this freedom, ironically, has come a greater philanthropic spirit and a broader understanding of community issues. Economic freedom is accompanied by an unpredictable trajectory of entrepreneurial philanthropy… And leftists hate the individualistic nature of self-interest. So, despite capitalism’s provably superior track record on environmental issues, communism has proven to be more admired by the big-government statists of the leftist environmental movement. After all, Communism promises a whole lot more power and cronyism to the friends of Figueres than an objectively market-driven laissez faire society. Figueres’ assertion that the smog-plagued, carbon-hungry, toxin spilling nation of China is better at environmental stewardship than the increasingly earth-conscious western democracies is another illustration of the UN’s agenda over fact. Just like UN scientists omitted inconvenient data to sell the notion of global warming, Figueres is willing to spew ludicrous assertions in an advocacy for centralized government, and redistributive policies. After all, what good is a UN Chief if they don’t push for ideology that was once adopted by the “evil empire”? Clearly, an ideology that led to millions of political prisoners and widespread environmental damage is best equipped to spur market based solutions to environmental pollution… Right? But, hey… At least she is more transparent than the American champions of redistributive-environmentalism.